What It’s About: Self aggrandizing thug Mark Brandon “Chopper” Read (Eric Bana) tells the story of his criminal exploits and life behind bars which may or may not be largely spun for the benefit of his hugely successful autobiography, on which today’s film is based. Why Watch it Today? : December 4th is the Feast of St. Barbara, the Patron Saint of Prisoners. 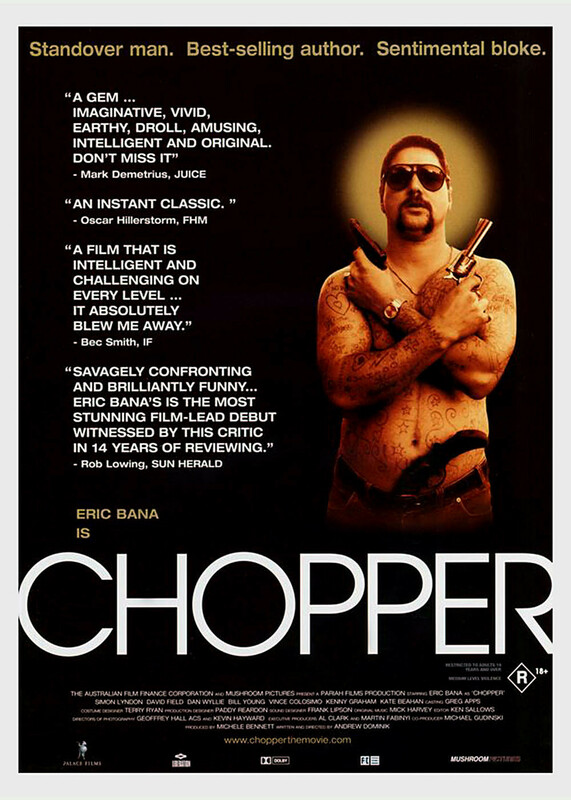 Chopper is an unusual adaptation of “Chopper” Read’s autobiography, faithfully recreating the sense that Read’s version of the facts don’t quite square with reality (or how much you would not really want to know him) despite their appeal as over-the-top fiction. It also features a star making turn from Eric Bana, who is amazing in the title role. This entry was posted in "Based on a True Story", "Foreign Film", Adaptation, Arthouse, Based on a Book, Biopic, Comedy, Crime, Drama, Movie of the Day, Prison and tagged Andrew Dominik, Australia, Australian Film Finance Corporation, before they were famous, Chopper, courtroom scene, Eric Bana, low-budget, Mark Brandon Read, prison, prison warden, prisoner. Funny. I did a review of this a few years back that got eaten when a hard drive died and had been meaning to redo it once I heard ol’ Chop-chop died a few months back but I got sidetracked. So, thanks for jogging my memory! I had no idea The Chopper died recently! Shortly after I saw this I got a hold of one his books through my library and read most of it before I had to send it back…I recall that it was very different from the film but good. Happy to remind you-more people should see this one.